For current FAQ, please head to our new and shiny Help Center. 1 For current FAQ, please head to our new and shiny Help Center. 1.2 What is the difference between User, Admin, Marketing, and Root? 1.3 Pricing - what’s the difference between credits and subscription? 1.4 How do you handle security and privacy? 1.5 What e-mail clients is SignatureSatori compatible with? 1.6 Do you support domain aliases (different “Send as” addresses)? 1.7 What payments do you support? 1.8 How secure is my payment? 1.9 How can I change my payment method? 1.10 Can I add or remove Users during the billing cycle? 1.11 How to input all details about users to SignatureSatori? 1.12 Are users allowed to edit their signatures? 1.13 Can I use custom fonts in my signature? 1.14 I renamed a domain or user in G Suite but it’s not appearing in SignatureSatori. 1.15 How do I remove users? 1.16 Why is my signature trimmed in Gmail? 1.17 How do I uninstall SignatureSatori? 1.18 How to use the marketing campaign planner? 1.19 Do you offer reseller program? 1.20 Does SignatureSatori work in Google Inbox? 1.21 I purchased a subscription and want to update the signatures immediately. 1.22 Can we allow individuals to set their own social media destinations? 1.23 There are two dashes before the signature. How do I get rid of them? 1.24 Can I use conditions in my signature to show certain lines only if the field is not empty? 1.25 Subscription for my account is active, what should I do next? 1.26 What is the difference between refresh modes? 1.27 How to add new users? SignatureSatori is a web app helping companies with e-mail signature management of their employees. We save you time and money offering a WYSIWYG editor with professional templates that enables you to set the signatures for a whole company in a few minutes keeping the same formatting for everybody. SignatureSatori is based on G Suite API providing reliable and secure connection to your data; we don’t have access to your passwords or your SMTP configuration. What is the difference between User, Admin, Marketing, and Root? User is the person whose signature is managed in the app. Users don’t have permission to change their signatures in the app directly, but they can use a form to request contact info changes that must be approved by Admin. Admin (or Administrator) is a person that has access to the app and can manage signatures, marketing planner, and payment methods. People flagged as "Marketing" have access to marketing planner, but are unable to make any payments, change payment methods or alter any User info. Root has got the same rights as Admin and on top of that can assign roles. Pricing - what’s the difference between credits and subscription? The key difference between credits and subscription is that purchasing credits is a one-time payment for a one-time setup while the subscription is a recurrent monthly payment for a daily synchronization. If you buy credits, you can use them anytime you need to edit the signature - spending the credit on user’s signature gives you a 24-hour window to edit this signature (even multiple times). If you decide for subscription mode, you pay a monthly fee depending on the number of signatures you manage. Using this method gives you a possibility to edit the signatures anytime you want, make use of our marketing planner and prevent users from changing their signature manually - their alterations will be reversed during a daily synchronization. The right choice depends on your needs and demands. If you just want to set the signatures and don’t plan on changing them in a few months, the credits will suit better. However, if you plan to use signatures as a marketing channel and edit them frequently, subscription mode will be cheaper and less constraining for you. We also offer a possibility to combine both methods. If you have employees that use their e-mail accounts only for internal communication, you can set their signatures with credits. At the same time different users can be in a subscription mode in order to communicate your chosen message via their signatures (useful for employees who are regularly in contact with your customers, e.g. sales department or customer service). How do you handle security and privacy? SignatureSatori is designed as G Suite Marketplace application. We adhere to set of best practices of secure enterprise application development defined by Google. We use OAuth 2.0 for G Suite authentication and authorization. This means we do not have access to your passwords or other security credentials; Google only lets us get the list of your employees (plus the contact details you manually insert) and permission to insert a signature into their Gmail settings. Used to set signatures to your users' Gmail accounts. To import users and users' work contact information from your domain. We actually don't use this permission as we store data in our Cloud Storage account. (We are going to remove this permission in the next major release). Google Cloud Storage is a specific Cloud platform product: https://cloud.google.com/storage/ that has nothing to do with Drive storage in G Suite. To gather information about admin rights. We don’t use SMTP to add signatures. You stay completely independent as no third party is involved in your mail exchange. We don’t have access to customers' emails in any way. Google Cloud Storage is built with a replicated storage strategy. Cloud Storage ensures the highest level of durability, availability, and performance. Our application is completely hosted on Google Cloud Platform. The database is accessible only via application server which has limited access available only with SSH-secured connection. Servers are hosted in the USA. What e-mail clients is SignatureSatori compatible with? SignatureSatori works seamlessly with the Gmail environment (on custom domains). The app communicates directly with the signature manager, and all changes are processed almost instantly. (The situation is a little bit complicated if you use e-mail aliases). The app doesn’t have direct access to offline clients (e.g. Outlook, Thunderbird, Apple Mail). The users can still get the signature you have prepared on end user page and copy/paste it. Or it can be downloaded in HTML (by pressing a button on the site). You can find more information here. Signatures managed by our app are directly supported only by Gmail for iPhone/iPad. The signature might take up to an hour before it appears at the e-mails sent from the app. If you hurry, re-installing the app will make the signature appear instantly. Or you can use the default iOS Mail app (instructions here). The Android Gmail app currently doesn’t support any signatures in HTML. If you use an alternative e-mail app that supports HTML signatures, you can set your signature by a simple copy/paste trick from an e-mail that you send yourself from the desktop client with applied signature. Do you support domain aliases (different “Send as” addresses)? We are currently supporting only one signature per user. That means that all your “Send as” addresses get the same signature. Google has recently given developers an option to support different "Send as" addresses and we are working hard on implementing it soon. We support a wide range of credit cards and Paypal payments. However, we don’t support AMEX cards - if you need to pay with AMEX, write us an e-mail. We use Braintree (a Paypal company) payment gateway, which is a certified Level 1 PCI DSS provider and is used by services like Uber or Airbnb. We don’t collect any credit card data, as these are sent through Braintree.js and SSL (secure connection) directly to Braintree servers. You can change your payment method in a payment modal window on Transactions that you see when you click on a “Buy Credits” button. 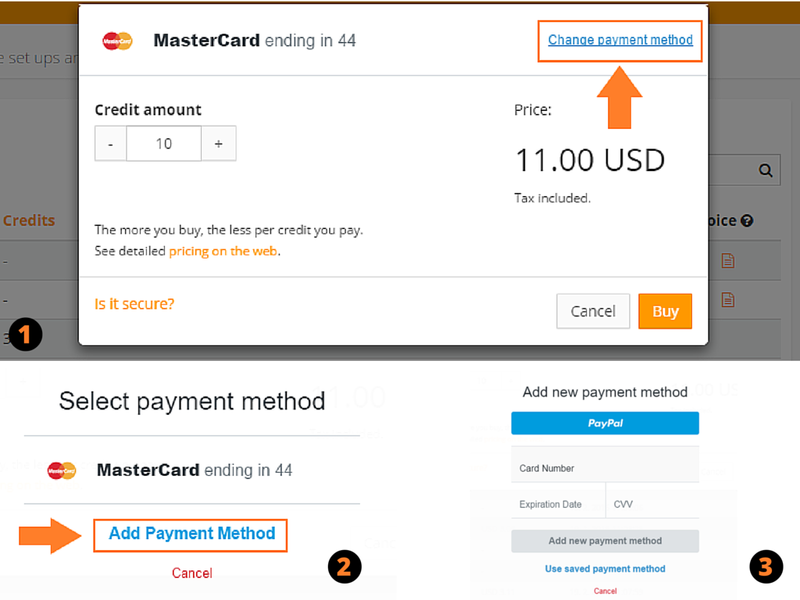 You will see your current payment method on the top and a link to "Change payment method" on the right of that box. In the next screen click "Add Payment Method". Enter your payment details and save with "Add new payment method". Close the "Buy Credits" window clicking on "Cancel" if you don't wish to purchase credits. If you want to set this method as default (e.g. for use in subscription) or want to delete some payment method, please contact us directly. Can I add or remove Users during the billing cycle? Yes, you can. If you’re afraid that if you add a user at the end of the month we will charge you full price, don’t worry. You pay for what you get - we calculate the price for a proportionate part of the month the subscription was active. However, if you remove users during the billing cycle, we don't return the payments. How to input all details about users to SignatureSatori? User data is imported from your company G Suite account. This solution means that you are required to edit the info about users only in G Suite and upload it later to SignatureSatori with a simple click (it’s not possible the other way round). Send your users a simple form that saves data to SignatureSatori app (not to G Suite). We strongly advise checking the data before setting the signatures as admin. You can always edit or add personal data about users as the administrator in the Users menu. Data entered here doesn’t save to G Suite. Are users allowed to edit their signatures? The users can request contact data change in a special form. Their requests must be approved by an administrator. That means users aren’t able to edit their signature in the app directly, but they still can change or edit the signature in their e-mail client. If you want to prevent users from doing that, we advise you to choose subscription mode - all signatures are updated daily and set to their desired state. Can I use custom fonts in my signature? The use of fonts is currently limited by e-mail clients. We advise using web-safe fonts to ensure your signatures are displayed the same way in different e-mail clients. I renamed a domain or user in G Suite but it’s not appearing in SignatureSatori. If you rename (or change any info about) Users in G Suite, you can download changes to SignatureSatori in Users menu by clicking "Reload and rewrite user information from GA". This option loads new users from G Suite to SignatureSatori and rewrites all information including domain changes and deletes removed users. You can’t delete (or add) users directly in SignatureSatori. In order to remove users from the app, you need to delete them in G Suite and then click “Load new users from GA” in SignatureSatori. This option synchronizes the users between both directories. Why is my signature trimmed in Gmail? Trimming is standard Gmail behavior. Your signature is always visible in the first message but remains hidden in replies. Trimming (hiding) repeated content supports clarity and brevity of e-mail conversations. How do I uninstall SignatureSatori? We’re sorry to hear that you plan on leaving us. Please, let us know about your reasons. We advise you to stop future recurring payment by canceling all subscriptions in "Subscription" menu. We will not charge you anymore after that and if you decide to use our services again if future, the setup will be much easier. How to use the marketing campaign planner? Pictures, text or links displayed as an appendix to your signature with assigned visibility days are called “Campaigns”. Campaigns are organized in “Sets” and sets can be assigned to “User groups”. The marketing planner allows you to plan automatized future changes for different "User groups". Do you offer reseller program? Yes, we do. You can find out more information here, and we will be happy to answer your additional questions. Does SignatureSatori work in Google Inbox? Unfortunately, Google Inbox doesn’t support automatized signature set-up (there is no support for programmatic signature management from Google yet). We are also working on a Chrome Extension that will apply the signature automatically. Expected release date is Q3 2017. I purchased a subscription and want to update the signatures immediately. The signatures in subscription mode are regularly updated at a certain hour (set by admin here). But sometimes you just need everything to work instantly - we have a quick solution for those circumstances, but it differs for three conditions you can find yourself in. It doesn’t matter if you set everything up today or have purchased the subscription formerly and forgotten about it. In both cases make sure that subscription is really active for all users you need. You can now use credits to force synchronize users’ signatures by clicking “Set signatures immediately”. Don’t worry that this will cost you extra, we gave you those credits for free when you purchased the subscription. After you successfully load new user data, force an update by clicking “Set signatures immediately”. This operation won’t cost you any credits. Don’t forget to activate your users after successful purchase of the subscription. Go to the Users page and switch to the "Credit mode" using a control on the top-left. Select users by ticking the checkbox. Click "Set signatures" at the bottom. Can we allow individuals to set their own social media destinations? There are two dashes before the signature. How do I get rid of them? Can I use conditions in my signature to show certain lines only if the field is not empty? For more information see Tutorial. Subscription for my account is active, what should I do next? Tick the checkbox "Active" for users whose signatures you wish to set daily in the Users list. You can see the number of used/available subscription seats in Subscription settings. Next signature set-up will occur at a time that you can see under the section Time of daily set-up in Subscription settings. You can change the time of the next set-up after this one there, too. What is the difference between refresh modes? Because of the integration with G Suite, we can load users with data saved in Google Directory and group memberships based on Organizational Units. Load new users from G Suite and delete ones that no longer exists. This doesn't affect any data currently stored in SignatureSatori. Load new users from Google Apps and delete ones that no longer exists AND rewrite all user details with data contained in G Suite Directory. This will affect all information inserted by users or administrator. Load new users from Google Apps and delete ones that no longer exists AND rewrite group memberships with according to membership to Organization Units in Google Apps. This will affect all custom groups that were created after initial import or modified groups memberships. A combination of option 2 and 3. Rewrites both user details and group memberships. This will affect all information inserted by users or administrator and all custom groups that were created after initial import or modified groups memberships. We don't support adding new users directly to SignatureSatori because it would cause issues with G Suite synchronization. The only way to add new users is to have them in G Suite and import them to the app. You can do this if you go to the Users menu and click "Load new users" below the list of users. This option will load new users from G Suite and delete the non-existing ones. Outlook is by default set not to display images in the emails, influencing signatures in a major way. You can enable the images by clicking the ribbon on top and choosing “Download pictures". There’s also an option to enable the images permanently. You can do so in File > Options > Trust Center > Automatic Download in Outlook 2010 and up or Tools > Options > Security > Change Automatic Download Settings in Outlook 2003.